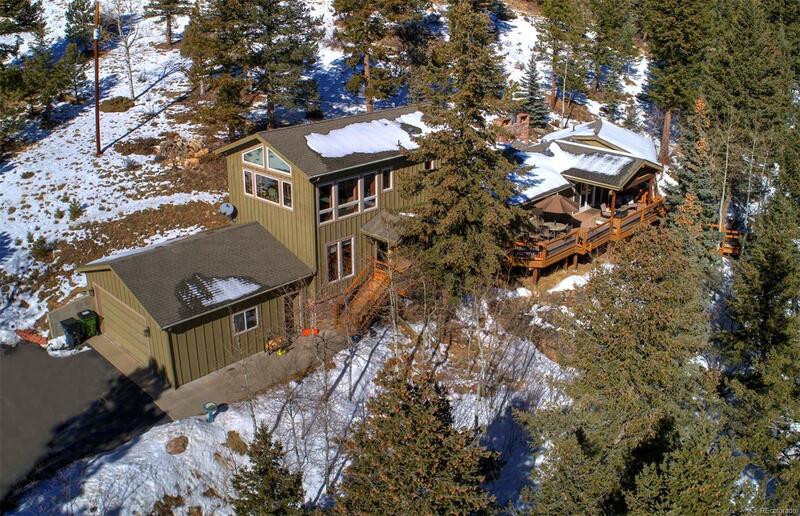 Beautiful Mountain Contemp backing up to 300 acres of Denver Mtn Park land for easy access to hike or mountain bike. A 2009 complete remodel with main lvl living and dual Master Suites. No room was untouched in this remodel including a spacious kitchen w/cherry cabs, large island, ss appliances, granite counters, huge pantry and much more. With a popular open floor the kitchen opens up into the dining space and a cozy living room with a stunning fireplace, hickory hard wood floors, knotty alder doors and easy access out to the covered deck. Enjoy the very private setting on the large deck while listening to the seasonal stream adjacent to the property. With distant mtn views, great valley views and gorgeous sunsets, the southern exposure makes the deck useable year round. Abundant wildlife, large Pines, and lots of Aspen trees. Hot water boiler and advanced treatment septic installed in 09 as well. Downtown Evergreen just minutes away. Easy commute to Denver.